In this day and age of people rushing around – increasingly hurried, harassed and distracted – many of us find that common courtesy is not so common anymore, and many of us just aren’t feeling appreciated by others, including the businesses that we purchase products and services from. 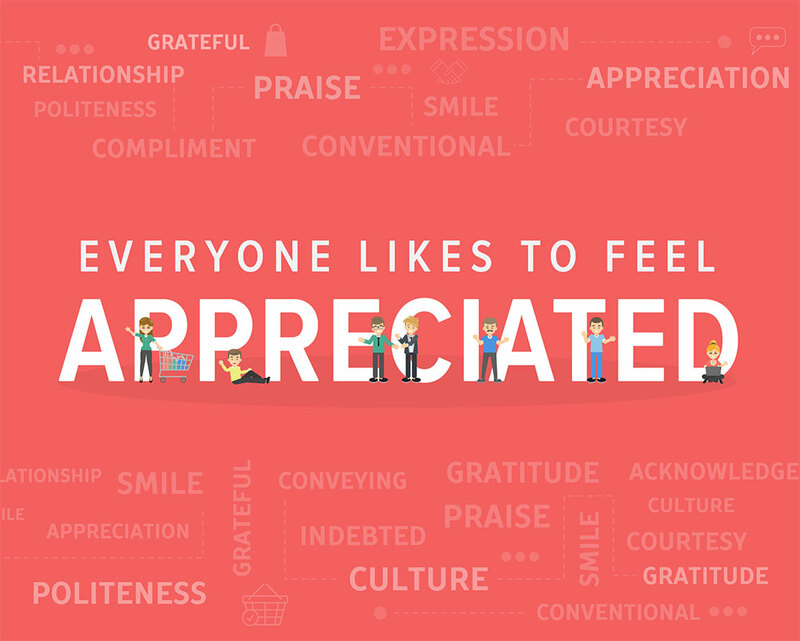 When you are spending your hard-earned money on something, you want to feel that the recipient of your money truly appreciates your business – and you want them to express that appreciation to you. Whether you are a patron of a couple of kids at their lemonade stand, an individual running a one-man show, a mom and pop shop, a family-operated restaurant or a huge international conglomerate, you want to walk away from your business transaction with a smile on your face and a feeling of warmth and connection inside. You want to feel that you have been acknowledged and recognized as a valuable customer and as a valuable human being. Think about it: How big was your smile when you heard the kids sing out “Thaaaank yooouuu!” as you dropped a dime into their tin can after they unsteadily splashed some lemonade into a Dixie cup for you? Or how accepted and appreciated do you feel when you walk into your favorite neighborhood haunt and see the smile on the host’s face and the light in his eyes when he sees you? When he purposefully strides over to you and tells you how good it is to see you again as he shows you to your table? And don’t you tend to make your tip a bit more generous when the waitress at the diner writes “Thank you!” next to her name and the smiley face that she drew on your check? Even when shopping online – how much colder and more impersonal can it get, when you have zero interaction with another human being? – don’t the corners of your mouth turn up just a bit if the site flashes a “Thank you for your purchase!” screen after you’ve hit “Confirm”? On the flip side, how likely are you to return to an establishment where nobody smiled at you, thanked you or even looked you in the eyes? And how empty does it feel to see just an impersonal purchase order number and shipping date on your computer screen after you’ve entered your credit card number? As businesspeople, it’s important for us to keep in mind that our clients and customers are real, live people – people who deserve to feel respected and acknowledged. They are not just another entry into our ledgers, not just another account in our client lists. And although our motivation for making people feel appreciated shouldn’t really be about profits, happy customers are loyal customers. Not only will they continue to patronize your business, but they will spread the word. Tweets and posts from satisfied clients can make your business grow like wildfire. Positivity is powerful energy to be harnessed and taken advantage of! Although it may happen subconsciously, if your brand is known for making people feel good, customers will talk about your brand, and that likely begets incremental sales. Making it easy and efficient to purchase your brand is important, but it is really just a table stake in today’s world. It’s how your brand makes people feel that matters, as neuroscience has established. Making customers feel recognized and appreciated should be a “no-brainer,” which makes it all the more surprising that not every brand ensures that this is done. Then again, their oversight might just be an easy differentiator for your brand.